In late October of 1991, three storm systems collided over the eastern seaboard of North America, creating a rare meteorological event. Dubbed 'The Perfect Storm' and 'The Storm of the Century', it was the product of the convergence of a hurricane heading north from Bermuda, a storm heading south from Sable Island, and a cold front heading east. It came suddenly and unleashed the full fury of Mother Nature on those caught in its path. Among those unfortunate enough to face the 'monster' was the crew of the fishing vessel Andrea Gail, whose ordeal at sea was recounted in the 1997 novel "The Perfect Storm", written by journalist Sebastian Junger. The novel, which was factually based and well-researched, became a best-seller, and caught the eye of director Wolfgang Petersen ("Air Force One"), who developed it into the feature film of the same name. 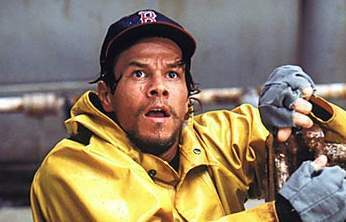 But even though "The Perfect Storm" remains faithful to the source material, has the star power of George Clooney and Mark Wahlberg (who both recently appeared in "Three Kings"), and effectively uses top-notch special effects to bring the fury of the 'monster' to life, there is little in the way of pay-off in watching the film, since the protagonists are placed in peril out of their own stupidity. The film starts off slowly with some background on the crew of the Andrea Gail. The skipper, Billy Tyne (Clooney), is in a slow period, with each swordfish haul being smaller than the last. With the bulk of the earnings going to the boat's heartless owner (Michael Ironside of "Starship Troopers"), there is little left over to split between Billy and his crew, which includes Bobby Shatford (Wahlberg), Dale Murphy (John C. Reilly of "Magnolia"), Bugsy Moran (John Hawkes of "Rush Hour"), and Alfred Pierre (Allen Payne of "New Jack City"). 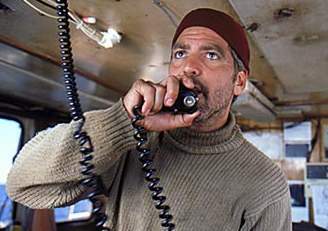 Out of economic necessity, Billy decides to take the Andrea Gail out one more time, late in the season, hoping to strike pay-dirt in the distant waters of the Flemish Cap, which is known not only for having 'lots of fish', but also 'lots of weather'. He solicits his crew to sign on for this last-ditch attempt to strike it rich, and given the economic gloom they find themselves in (for various reasons), they agree. However, the choice is not easy for some-- Bobby is in love with divorced mom Christina Cotter (Diane Lane of "Murder at 1600"), who is opposed to him going out again so soon, while Dale wants to spend more time with his son. The Andrea Gail also takes on a new crewmember, David Sullivan (William Fichtner of "Go"), who immediately has a run-in with Dale over some past misdeed. The trip out to the fishing grounds is relatively uneventful (though there are a couple of close calls), and the men find the bounty of fish they were looking for. However, during their time at sea, a massive weather system has been brewing behind them, and when it comes time to turn back and head for home, the three storms are about to collide. Not willing to let their bountiful catch spoil by waiting for the storm to subside, Billy and his crew decide to plow straight through and make a killing at the market. Unfortunately, they vastly underestimate the strength of the storm, and they soon find themselves in a seemingly endless night, battling against hurricane force winds and 100-ft waves. Technically speaking, "The Perfect Storm" is simply stunning as every trick in the book is employed to depict a raging storm at sea, which I'm sure built on Petersen's previous experience on his award-winning at-sea adventure, "Das Boot". Petersen conveys the awesome force unleashed by the converging storms, depicting giant wave swells that mercilessly pound large ocean-going tankers and threaten to completely engulf smaller vessels. If there ever was a perfect film for raising public awareness about the dangers of underestimating weather conditions while at sea, "The Perfect Storm" would fit the bill. The sheer convincing nature of the visuals should make anyone think twice about sailing on the open seas in anything smaller than a cruise ship. This is further exacerbated by a subplot involving the travails of a Coast Guard helicopter crew and their attempts to rescue the Andrea Gail. In a stunning series of sequences, the audience is given a harrowing perspective on the difficulties of effecting a rescue at sea in the midst of a storm-- first, when the crew attempts to rescue a small sailboat named the Mistral, and second, when they run into difficulties themselves while trying to reach the Andrea Gail. As they are portrayed in the film, no sacrifice is too great for the Coast Guard crew when it comes to performing their duties, since one of them dies during a rescue attempt. 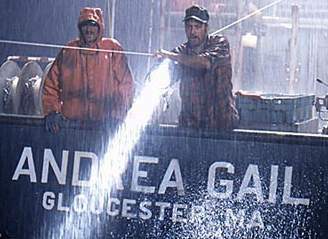 Given that both the captain of the Mistral (Bob Gunton of "Patch Adams") and the crew of the Andrea Gail have foolishly put themselves in harm's way (out of pride in the first case, and for economic reasons in the latter), audience sympathy ends up being turned against the crews of the two vessels, while being redirected towards their would-be rescuers, some of whom make the ultimate sacrifice. Narrative-issue asides, the performances are adequate, given the fact that the entire cast essentially plays second fiddle to the film's monstrous special effects. Clooney and Wahlberg take a break from their usual clean-cutroles, and are quite convincing as grubby, salt-of-the-earth types. 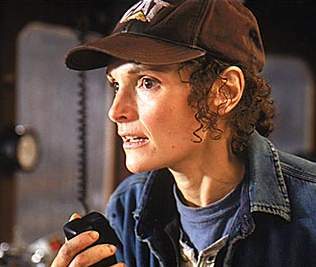 Mary Elizabeth Mastrantonio ("Limbo") does a memorable turn as the captain of the Hannah Boden, the sister ship of the Andrea Gail, while Lane effectively conveys her character's unbound optimism that gradually gives way to unrelenting dread. Yes, "The Perfect Storm" is the type of film that should be viewed in a state-of-the-art theater in order to get the heart-pounding experience. If you've never been in a storm at sea, this is probably as close as you'll ever get without getting wet. However, if more attention had been paid to making the protagonists in the story more sympathetic and giving the audience a better understanding of the aftermath of the event, perhaps there would have been a greater pay-off in the end. Unfortunately, as is, "The Perfect Storm" doesn't pack much of a wallop.